This 7.1 speaker home theater system from Pyle turns your TV room into a screening room! It comes with seven satellite speakers, including one center speaker, and a subwoofer, for a total of 160 watts of theater-quality sound. But it isn't just speakers - the PT798SBA includes a receiver with an FM radio, wireless Bluetooth audio compatibility, and gold capped AV inputs to serve as a selector between audio equipment. And you can control it all - your bass and treble settings, the input, FM frequency - using the included wireless remote. The digital VFD display is gorgeous and displays relevant information. 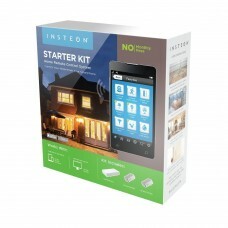 This INSTEON 2244-224 starter kit includes a hub, which connects to your router and lets you remotel..